Eugene is a city of the Pacific Northwest located in the U.S. Visiting Cape Perpetua Visitor Center - Siuslaw National Forest and Willamette River bike trail will get you outdoors. Willamette Valley Vineyards and The Historic Carousel and Museum are good opportunities to explore the local culture. Get out of town with these interesting Eugene side-trips: Devil's Churn (in Yachats) and Fitton Green Natural Area (in Corvallis). The adventure continues: get outside with Spencer Butte. To see reviews, more things to do, traveler tips, and other tourist information, you can read our Eugene day trip site . Muri, Cook Islands to Eugene is an approximately 21.5-hour flight. You'll lose 2 hours traveling from Muri to Eugene due to the time zone difference. Plan for a bit cooler nights when traveling from Muri in September since evenings lows in Eugene dip to 11°C. Wrap up your sightseeing on the 28th (Sat) to allow time to travel to Seattle. Escape the urban bustle at Murhut Falls and Hiram M. Chittenden Locks. Appreciate the collections at Chihuly Garden and Glass and Glasshouse Studio. 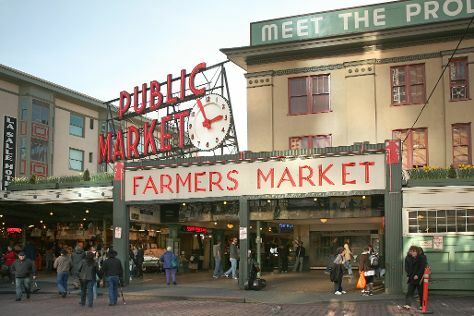 Next up on the itinerary: shop like a local with Pike Place Market, examine the collection at The Museum of Flight, wander the streets of Pioneer Square, and enjoy breathtaking views from Space Needle. To find where to stay, other places to visit, more things to do, and tourist information, refer to the Seattle trip maker site . You can fly from Eugene to Seattle in 3 hours. Other options are to drive; or take a bus. When traveling from Eugene in September, plan for a bit cooler days in Seattle, with highs around 26°C, while nights are somewhat warmer with lows around 15°C. Finish up your sightseeing early on the 1st (Tue) so you can catch the flight to Friday Harbor. Kick off your visit on the 2nd (Wed): see the interesting displays at The Whale Museum and then see majestic marine mammals with a dolphin and whale watching tour. Use Inspirock's suggestions to plan your Friday Harbor trip and find the best activities and attractions for your vacation. Traveling by flight from Seattle to Friday Harbor takes an hour. Alternatively, you can ride a ferry. Traveling from Seattle in October, you can expect nighttime temperatures to be slightly colder in Friday Harbor, with lows of 8°C. Finish your sightseeing early on the 2nd (Wed) so you can travel to Forks. Forks is a city in Clallam County, Washington, United States. Step out of the city life by going to Ruby Beach and Rialto Beach. Explore Forks' surroundings by going to Olympic National Park (Hoh River Trail, Hoh Rain Forest Visitor Center, & more). To find reviews, maps, ratings, and other tourist information, use the Forks route builder site . Traveling by car from Friday Harbor to Forks takes 5.5 hours. In October in Forks, expect temperatures between 19°C during the day and 8°C at night. Finish up your sightseeing early on the 5th (Sat) so you can travel to Quinault. Quinault is an unincorporated community in Washington in Grays Harbor County, Washington, United States. Get in touch with nature at Deer Park and Lower Big Quilcene Trail. You'll find plenty of places to visit near Quinault: Olympic National Park (Kalaloch Beach Trail 4, Bunch Creek Falls, & more). There's more to do: take a peaceful walk through Quinault Rain Forest and identify plant and animal life at Quinault Big Spruce Tree. For maps, more things to do, photos, and tourist information, read our Quinault trip itinerary builder tool . You can drive from Forks to Quinault in 1.5 hours. In October in Quinault, expect temperatures between 19°C during the day and 10°C at night. Wrap up your sightseeing on the 8th (Tue) early enough to travel to Port Angeles. Port Angeles is a city in and the county seat of Clallam County, Washington, United States. Get outdoors at Hurricane Ridge and Olympic National Park. Get out of town with these interesting Port Angeles side-trips: Sequim Bay Scenic Pullout (in Sequim) and Olympic National Park (Second Beach Trail, Mount Storm King, & more). Plan my day in Port Angeles using traveler tips and tourist information provided by Inspirock. Getting from Quinault to Port Angeles by car takes about 2.5 hours. In October, plan for daily highs up to 17°C, and evening lows to 7°C. Cap off your sightseeing on the 11th (Fri) early enough to travel to Marquette. Marquette is a city in the U.S. On the 12th (Sat), stroll through Iron Ore Heritage Trail and then admire the majestic nature at Presque Isle Park. To find reviews, more things to do, photos, and more tourist information, read our Marquette trip site . Fly from Port Angeles to Marquette in 9.5 hours. Alternatively, you can do a combination of flight and car; or drive. Traveling from Port Angeles to Marquette, you'll lose 3 hours due to the time zone difference. Expect slightly colder temperatures when traveling from Port Angeles in October; daily highs in Marquette reach 13°C and lows reach 3°C. Finish your sightseeing early on the 12th (Sat) so you can travel to Detroit. Motown Museum and St. Florian Catholic Church will appeal to history buffs. Take a break from the city and head to Seven Ponds Nature Center and Elizabeth Park. Explore Detroit's surroundings by going to Paint Creek Trail (in Rochester), River Raisin Territorial Park (in Monroe) and Oakwood Metropark Nature Center (in New Boston). The adventure continues: examine the collection at The Henry Ford and explore the world behind art at Detroit Institute of Arts. For traveler tips, more things to do, where to stay, and other tourist information, read our Detroit trip planner . Fly from Marquette to Detroit in 4 hours. Alternatively, you can do a combination of bus and flight; or drive. Expect somewhat warmer temperatures when traveling from Marquette in October; daily highs in Detroit reach 20°C and lows reach 10°C. Cap off your sightseeing on the 15th (Tue) early enough to go by car to Niagara Falls. Popular historic sites such as Our Lady of Victory Basilica and St. Mary of the Cataract R. C. Parish are in your itinerary. You'll explore and learn at Genesee Country Village & Museum and Niagara Falls Underground Railroad Heritage Center. There's still lots to do: explore the fascinating underground world of Cave of the Winds, take in the pleasant sights at Goat Island, and admire the sheer force of Niagara Falls. To find maps, other places to visit, photos, and tourist information, go to the Niagara Falls holiday builder site . Drive from Detroit to Niagara Falls in 4.5 hours. Alternatively, you can fly; or take a train. Expect a daytime high around 20°C in October, and nighttime lows around 9°C. Cap off your sightseeing on the 18th (Fri) early enough to travel to Washington DC. Popular historic sites such as Washington National Cathedral and Tomb of the Unknowns are in your itinerary. National Air and Space Museum and United States Holocaust Memorial Museum are good opportunities to explore the local culture. There's lots more to do: admire the masterpieces at National Gallery of Art, steep yourself in history at Frederick Douglass National Historic Site, take an in-depth tour of National Portrait Gallery, and get a new perspective on nature at Smithsonian National Museum of Natural History. To see reviews, ratings, other places to visit, and tourist information, go to the Washington DC day trip planner . Traveling by combination of bus and flight from Niagara Falls to Washington DC takes 4.5 hours. Alternatively, you can do a combination of bus, flight, and train; or drive. Prepare for somewhat warmer weather when traveling from Niagara Falls in October: high temperatures in Washington DC hover around 25°C and lows are around 14°C. Wrap up your sightseeing on the 21st (Mon) to allow time to travel to Charleston. Visiting Dolphin & Whale Watching and Fishing Charters & Tours will get you outdoors. Do some cultural sightseeing at Fort Sumter National Monument and St. Michael's Church. Step out of Charleston to go to Awendaw and see The Center for Birds of Prey, which is approximately 38 minutes away. There's still lots to do: get interesting insight from Tours, get to know the fascinating history of Charleston History Tours, contemplate the long history of Nathaniel Russell House, and don't miss a visit to Charleston Fire Department, Station 2/3. For more things to do, traveler tips, ratings, and more tourist information, refer to the Charleston trip planning tool . You can fly from Washington DC to Charleston in 4 hours. Other options are to do a combination of train and flight; or drive. Traveling from Washington DC in October, expect Charleston to be somewhat warmer, temps between 30°C and 18°C. Finish your sightseeing early on the 24th (Thu) so you can travel to Charlotte. On the 25th (Fri), see the interesting displays at NASCAR Hall of Fame, get curious at Carolina Raptor Center, and then trek along Buzzard Rock Trail. For photos, ratings, and more tourist information, read our Charlotte travel itinerary planner. Traveling by flight from Charleston to Charlotte takes 3.5 hours. Alternatively, you can drive; or do a combination of car and flight. Traveling from Charleston in October, you can expect nighttime temperatures to be little chillier in Charlotte, with lows of 12°C. Wrap up your sightseeing on the 25th (Fri) to allow time to travel to New Orleans. Step out of the city life by going to Chalmette National Historical Park and Woldenberg Park. Satisfy your inner culture vulture at French Quarter and Garden District. Next up on the itinerary: learn about all things military at The National WWII Museum, examine the collection at Audubon Butterfly Garden and Insectarium, explore the different monuments and memorials at Lafayette Cemetery No.1, and wander the streets of Royal Street. Find out how to plan New Orleans trip without stress by asking Inspirock to help create an itinerary. You can fly from Charlotte to New Orleans in 4 hours. Other options are to do a combination of flight and car; or drive. Traveling from Charlotte to New Orleans, you'll gain 1 hour due to the time zone difference. Expect a bit cooler weather when traveling from Charlotte in October: highs in New Orleans hover around 22°C, while lows dip to 22°C. Finish your sightseeing early on the 28th (Mon) to allow enough time to travel to Taos. Start off your visit on the 29th (Tue): explore the galleries of Vietnam Veterans Memorial, then delve into the distant past at Taos Pueblo, and then identify plant and animal life at Wild Rivers Recreation Area. To find ratings, where to stay, more things to do, and other tourist information, read Taos trip itinerary app . Traveling by combination of flight and shuttle from New Orleans to Taos takes 9 hours. Alternatively, you can do a combination of flight and car; or drive. The time zone difference moving from Central Standard Time to Mountain Standard Time is minus 1 hour. Traveling from New Orleans in October, plan for cooler nights in Taos, with lows around 0°C. Finish your sightseeing early on the 29th (Tue) to allow enough time to drive to Colorado Springs. Your cultural itinerary includes sights like National Museum of World War II Aviation and St. Mary's Catholic Cathedral. Take a break from the city and head to River Rafting & Tubing and Adventures Out West. And it doesn't end there: stroll through Garden of the Gods, get in on the family fun at North Pole - Santa's Workshop, and admire nature's wide array of creatures at Cheyenne Mountain Zoo. To see where to stay, traveler tips, maps, and tourist information, use the Colorado Springs online holiday planner . Traveling by car from Taos to Colorado Springs takes 4.5 hours. Alternatively, you can do a combination of car and flight; or do a combination of shuttle and flight. Traveling from Taos in October, Colorado Springs is a bit warmer at night with lows of 4°C. Wrap up your sightseeing on the 1st (Fri) to allow time to travel to Salt Lake City. On the 2nd (Sat), take in breathtaking views at Big Cottonwood Canyon and then explore and take pictures at Guardsman Pass Scenic Backway. Get ready for a full day of sightseeing on the 3rd (Sun): explore the striking landscape of Golden Spike National Historic Site. For traveler tips, maps, photos, and other tourist information, you can read our Salt Lake City vacation maker site . Traveling by flight from Colorado Springs to Salt Lake City takes 3 hours. Alternatively, you can do a combination of shuttle and flight; or drive. Traveling from Colorado Springs in November, expect somewhat warmer with lows of 1°C in Salt Lake City. Wrap up your sightseeing by early afternoon on the 4th (Mon) to allow enough time to travel back home.